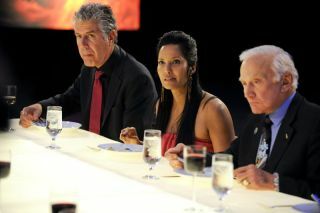 Anthony Bourdain, Padma Lakshmi and Buzz Aldrin dining during the "Space Food" episode of Top Chef. Angelo Sosa's short ribs are destined for the International Space Station. As a 'cheftestant' on Bravo's Emmy Award-winning cable reality TV show "Top Chef," Sosa won this week's episode where the challenge was to develop a dish for the astronauts to eat in space. "My food is going to be in outer space!" exclaimed Sosa after learning that his concoction had won. "It is too much to embrace as a human to be honest to you. I need to breathe a little bit and process and everything." As it turns out, NASA needs some time to process Sosa's win too, to "deconstruct" his dish and make it suitable for spaceflight. "We're going to try to remain as true to the original recipe as possible but until we actually [freeze-dry] it, we won't know exactly how much modification we have to make," explained Vickie Kloeris, NASA's own 'top chef' for the International Space Station, in a post-show interview with collectSPACE.com. "It is going to be a kind of trial and error thing." Addressing the chefs during the show, which aired Wednesday night, Kloeris offered her advice as to what to include and avoid in their dishes. "We do have a couple of things that we normally look at when creating freeze-dried formulations: not a high, high level of sugar because it doesn't freeze-dry super well, and then also very large pieces, ingredients tend to not freeze-dry as well," she said. "And a lot of our astronauts say that spicier things on orbit taste really good." Some of the judges, including lead judge and chef Tom Colicchio, thought Sosa's use of ginger was too sweet. "I really made a conscious effort to go light on the sugar," Sosa said. "In my head I'm like, 'Oh my God, that's too sweet. It can't be too sweet [as it's] going to the space station.'" Ultimately, the judges thought Sosa's short ribs were "an out-of-this-world dish." "I thought this dish was very sophisticated and I think might actually be easily adaptable to an extraterrestrial situation," said guest judge and chef Anthony Bourdain during the show. Apollo 11 moonwalker Buzz Aldrin, who with his fellow astronauts Sandra Magnus and Leland Melvin were invited to taste the dishes, hinted at the challenge NASA would face adapting Sosa's creation. "Very tasty and then when I got the pickled mushroom ... what a surprise!" Aldrin remarked. "But I could see where it would be difficult to keep those together in some space dish." Kloeris said the solution may be just that -- to divide the dish and perhaps even leave some elements behind. "It is kind of three things in one and we are really probably going to have to break it down into separate components to be able to freeze-dry it," she said. "Also, the dish was served with components at different temperatures. We will not be able to do that." "I'm not even sure we are going to touch the horseradish because [the astronauts] already have a horseradish condiment sauce that is available to them on orbit," Kloeris added. "We're looking at that, but there is a good possibility we'll just do away with that part of it because they add that back by using the horseradish condiment paste they have on orbit." Continue reading at collectSPACE.com to learn when Angelo Sosa’s short ribs will fly to space and how they fared as space food compared to the losing dish.